Many home energy improvement opportunities are behind walls, in places we don’t often see. Others are things we see every day and have simply grown accustomed to. Explore all of the improvement projects that can be done with your local expert in Home Performance with ENERGY STAR and learn how you can experience the difference. 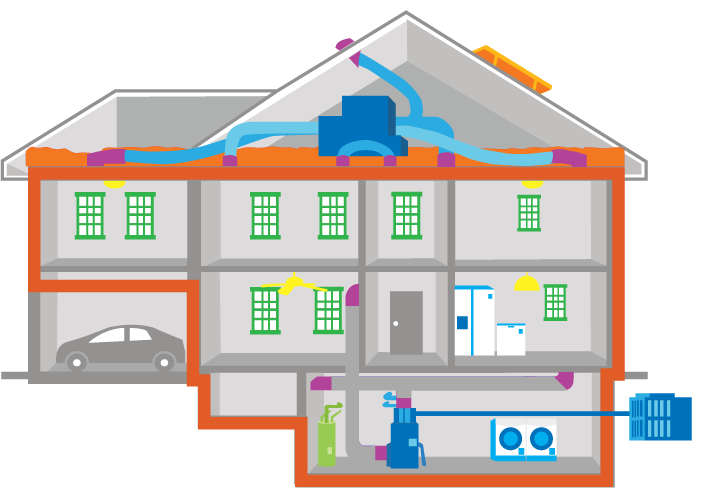 The most cost effective way to make your home more comfortable and save energy is by sealing air leaks and insulating your attic. This will keep cool air in during the summer and out during the winter. You can seal up obvious drafts around doors and windows by adding weather-stripping but you will need a professional to locate and properly seal common leakage paths that may be hidden in attics, crawlspaces, and basements. Sealing the attic before insulating will maximize the effectiveness of your insulation investment and protect against possible moisture problems in the future. Tip: A participating Home Performance with ENERGY STAR contractor will use diagnostic tools like a blower door and infrared camera to identify hidden air leakage paths and measure results. ENERGY STAR certified insulation is independently tested to ensure it delivers performance while meeting strict safety standards. The heart of your home comfort lies in your heating and cooling system. Learn basic maintenance, such as changing filters and using smart controls, and look for the signs of a needed system repair or replacement. Tip: Choose ENERGY STAR equipment installed by a Home Performance with ENERGY STAR participating contractor. Behind the walls and between the floors of your home is a network of channels called ducts, which carry air from the heating and cooling systems to the various rooms in your home. Sealing leaks or holes in the ductwork ensures you are getting the heating and cooling you are paying for where it needs to go, while keeping your energy bills down. Tip: In spite of the name, duct tape should not be used to seal ducts. Hire a qualified HVAC (heating, ventilation, and air conditioning) or home performance professional to make sure ducts are sealed using appropriate materials and techniques. A participating Home Performance with ENERGY STAR contractor will use diagnostic tools to locate duct leaks, measure results, and ensure that heating and cooling equipment is operating correctly with newly sealed ductwork. The windows on your home act like a barrier wind, heat, cold, and noise. They can also capture heat from the sun which can be beneficial in the winter, but may not be desirable in the summer. Enjoy your view to the outside with the right windows. ENERGY STAR provides specifications for windows that are designed to meet the needs of each climate zone in the U.S. Tip: When it is time for window replacement, choose products that are ENERGY STAR certified for your climate zone. Immediately start saving energy and money by changing some light bulbs and fixtures to LEDs. Start with those you use most and consider places in your home where dimmer switches or motion controls could be used so you can save even more. Tip: Choose ENERGY STAR certified bulbs and fixtures whenever possible, which have undergone testing to ensure energy savings and high performance. If you have older appliances, it might be time for an upgrade. When weighing your options, consider both the purchase price and the cost to operate the appliance. Always use power strips with your electronics to ensure they use energy only when turned on. Tip: ENERGY STAR certified appliances can give you more, for less. You’ll get all the best performance without the added cost or energy use. Cooking, cleaning, and bathing…frequent activities in a home, right? That’s why water heaters are the second highest source of energy usage in the home. Tip: ENERGY STAR certified water heaters can use 50 percent less energy than equipment that meets the minimum federal standard. Show off your commitment by going solar! Once you’ve made energy efficiency improvements, reduce your energy usage and bill with a solar hot water heater or solar photovoltaic system. Tip: Many states offer tax rebates for solar systems. Check with your utility to find out if your state is one of them. Home Performance with ENERGY STAR is home improvement done right. More comfort and more savings with the quality and value you deserve.